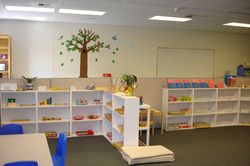 Montessori Way has been serving the families of Almaden Valley and Blossom Valley since 2007. At Montessori Way Preschool, children are exposed to a well-prepared environment that consists of academics (mathematics, language, science), arts and music and movement. Children learn by using the many hands-on Montessori materials and by being in an environment that allows them to work at their own level in a mixed-age group without feeling peer pressure. We make education a fun journey that provides the opportunity for each child to extend their knowledge to the highest of their ability.